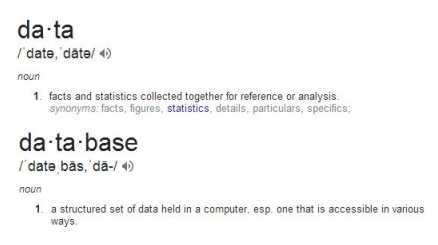 According to the above definitions, the difference between a database and a knowledgebase is that the data in a kowledgebase has been processed by rules, which represent the fruits of experience. A knowledgebase is a special kind of database for knowledge management. Knowledge may be defined as the theoretical or practical understanding of a subject, which in terms of classical AI means facts and rules. In fact, an algorithm is a process or set of rules. An expert system is a computer system that emulates the decision-making ability of a human expert, using reasoning. And in this case, reasoning is a rule-based process applied to a knowledgebase. In this day and age, web semantics are considered the sine qua non of knowledge representation. SPARQL is to RDF as SQL is to RDB. Triples can be thought of as basic sentences, with subject-predicate-object, showing relationship. Thus knowledge about things is represented in the relationship. A knowledge graph is a set of triples, or RDF statements. A graph store, or graph database, is a repository of these knowledge graphs. Almost all big social media monitoring products, such as Alterian and Radian6, will store tweets for you in a database, at a price. project aiml-owl .. in 2007, this was my initial investigation into the conversion of xml dialects into semantic formats such as rdf. project je .. in 2007, this was a joint project with mamet & associates to represent early feed bots in a comprehensive, dynamic asp website. project james .. in 2008, this was a short-lived exploration with a professional associate into wamp, mysql, microsoft sql server, entity relationship diagramming, and xsl transformations (xslt). project simon .. in 2008, this was a collaboration with an expert colleague to create a proof of concept for a proprietary component to convert concgrams (similar to n-grams) into associated latent semantic indexes using spss. project vagabot .. in 2009, this phase represented the culmination of efforts to convert my book, vagabond globetrotting (epub), into the vagabot conversational agent. project stelarc .. in 2009, i consulted with the famous performance artist known as stelarc, as much about his work as my own.